NEW YORKThe Socialist Workers Party here has nominated Dan Fein, a sewing machine operator, as its candidate in the 2009 mayoral race. James Harris, a union meat packer, is the SWP candidate for mayor in Los Angeles. The two SWP candidates are calling for workers to take political power out of the hands of the capitalist class in order to defend themselves from mounting layoffs; cuts in transit, health care, and schools; greater assaults on workers rights; and the consequences of Washingtons expanding war in Afghanistan and Pakistan. The socialist campaigns are being launched just weeks after the close of the 2008 presidential race, in which SWP candidates received a warm response from working people and youth to their advocacy of a revolutionary struggle to replace capitalist rule. Fein, 63, is running against billionaire Michael Bloomberg, a Republican who has now adopted the affiliation independent and is seeking a third term in office; U.S. Representative Anthony Weiner and City Comptroller William Thompson, both Democrats; and others. Citing the spreading capitalist financial crisis, the New York State and city governments are laying plans for deep cuts in Medicaid programs, health care, and education. The Metropolitan Transit Authority (MTA) is proposing to raise fares as much as 25 percent while decreasing the number and frequency of trains and buses, eliminating some routes altogether, and cutting 2,800 transit jobs. The MTA says it has a $1.2 billion budget deficit. The employers in New York and the Democratic and Republican politicians who serve their interests are trying to resolve their economic crisis by stealing more of the wealth we produce, Fein said. But were not the ones responsible for this crisis, they are! Fein joined more than 2,000 workers who rallied in the town of Patchogue, New York, November 14 to condemn the lynching of Ecuadoran immigrant Marcelo Lucero. The socialist candidate brought back photographs of the demonstration to show to coworkers at the sewing shop where he works and to explain the need to legalize all undocumented workers. 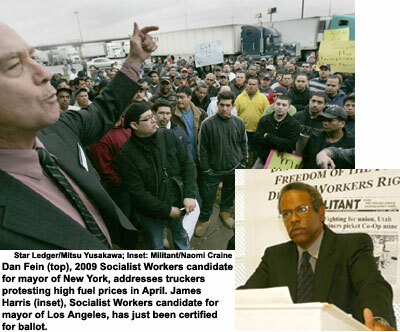 Harris, who belongs to the United Food and Commercial Workers union, was the first candidate to file nominating petitions in the Los Angeles mayoral race and the first to be certified for the ballot. On December 20 Harris will participate in a march to demand justice for Christian Portillo, who was killed by Los Angeles County sheriffs deputies in July. His family is organizing the action on what would have been his 35th birthday.